Argus Radiology “Personalizing TeleRadiology” – is a Joint Commission accredited, radiologist owned and operated, teleradiology company with average turnaround times consistently (every month since 2013) under 20-minutes and accuracy rates greater than 99.85%. Last month, December 2017, Argus Radiology averaged a turnaround time of 12:43 minutes (the time an image is received to the time an Argus Radiologist report is delivered to the ER) on exams interpreted for Gibson Area Hospital (1120 N Melvin St, Gibson City, IL 6093). Argus Radiology (cited as one of three US-based companies as a key provider of TeleRadiology service, Military News, 2017) announced the completion of physician licensing in Illinois with immediate plans to further expand their state-of-the-art teleradiology service to hospital emergency departments and radiology group practices within the state. According to Jamey Wright, MD, Argus Radiology’s Founder and President, "Over the past couple years we have received requests for service from Illinois hospitals and Radiology group practices. We currently provide radiology coverage (via teleradiology) at Gibson Area Hospital in Gibson, Illinois. It was an easy decision to license all our radiologists in Illinois and expand our availability within the state." The teleradiology industry, often referred to as the ‘Grandfather of Telemedicine,’ has reached a stage of maturity where many companies are experiencing slower growth and have begun to compete with their customer base by staffing Radiologists on-site. Argus Radiology, conversely, has doubled-down on the TeleRadiology marketplace with favorable growth. Their growth is partially attributed to their unique business model which they believe is more patient focused. “In teleradiology, bigger is not always better,” says Todd Moritz, Argus Radiology’s Director of New Business Development. “At Argus, we are a seamless extension of our clients and partner facilities. 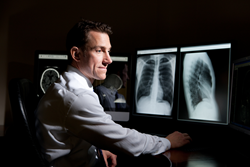 By assigning a limited number of Radiologists to each facility, usually 5-7 radiologists, a comfortable familiarity exists between the facility's staff and our remote reading radiologists. We feel this familiarity translates into better communication and collaboration between physicians and staff, with the goal of enhanced patient care." Since 2013, Argus Radiology has an averaged a turnaround time of 17:35 minutes, without a single month exceeding an average of 20:00 minutes, with a discrepancy rate of less than 0.13 percent. Additionally, the company strives to personalize their services to each customer's unique needs, whether the customer is a radiology group, community hospital, or free-standing emergency room. Dr. Michael Khoury, originally from Wichita, KS and now practicing from his home in California, joined Argus Radiology six years ago. He claims that working for Argus is less corporate and has a more human component. “Dr. Wright (practicing Diagnostic Radiologist and Founder/President) understands what’s expected of radiologists. He does a good job of taking care of us (radiologists). In turn, this allows us to remain focused on taking care of our clients and patients,” says Khoury. Argus radiologists are directly accessible to their customers to provide clear, unfiltered communication, timely information, and be a dependable resource for the physician ordering an interpretation on an X-ray, CT, MRI, or other modality. “Teleradiology is a very competitive market,” says Wright. “We continue to look for opportunities that support Radiology group practices and each of customers unique needs."